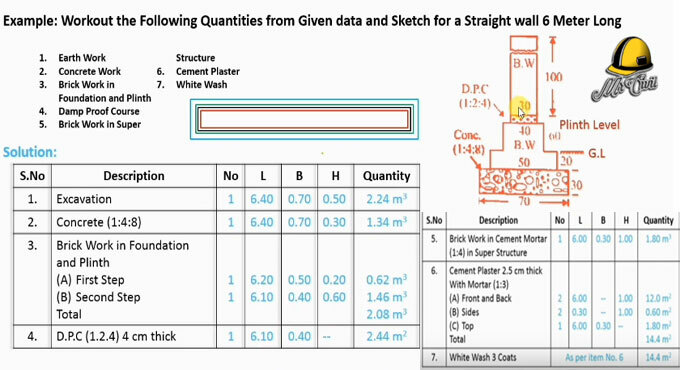 In this civil engineering video tutorial, you will learn how to find out the quantity of a straight wall. The steps involved in estimating process are cost for digging, PCC foundation, brickwork, DPC, Brickwork, Plaster and at last white wash. The ratio of DPC is 1:2:4. In plinth level (1st step), height is taken as 60 cm, width 40 cm. In construction of second step, the height is taken as 20 cm and width is 50 cm. Ground level is located here. The ratio of construction in ground level is (1:4:8). In PCC work at the end, the height is taken as 30 cm and width is 70 cm. To obtain the value of 6.40 meter, deduct the height of the wall from the height of the PCC i.e. 70 – 30 = 40 cm = 0.40 m. After adding this to total height of the wall, we get 6.40 meter. The breadth will be the breadth of PCC i.e. 70 cm = 0.70 meter. The height should be taken by adding the height of ground level and the height underneath i.e. 20 + 30 = 50 cm = 0.50 meter. After multiplying the three, we get 6.40 x 0.70 x 0.50 = 2.24 m3. So, the quantity required for excavation = 2.24 m3. To learn how to work out the quantity of other items, go through the following video tutorial.